The Nissan Leaf Nismo is going on sale in Japan this month, featuring a retuned computer that promises better acceleration and more performance-oriented tires and suspension. But the real speed comes from the strips of red trim, of course. It’s best to think of the Leaf Nismo as more akin to a BMW M-performance package than a proper M-car, with the upgrades subtly tuning the car’s character and look. Power numbers weren’t listed in Nissan’s press release, but you can expect largely similar output to the regular Leaf with just a light focus on handling and response to differentiate the Nismo model. So, for those of you waiting for a budget performance EV, well, keep waiting. This isn’t the everyman P100D, as the base Leaf cruises to 60 in a leisurely 7.4 seconds in Car & Driver testing and we aren’t expecting a substantial improvement for the Nismo model. It’s just the Leaf you know, with at least a nodding glance in the direction of fun. On the outside, you can tell Nismo Leafs apart by their wheels, splitter/diffuser combo and a pair of unique two-tone paint jobs. And then there’s that cute little rally light in the bottom. Inside, the Nismo model gets some red and gray accenting along with a flat-bottomed Alcantara steering wheel. 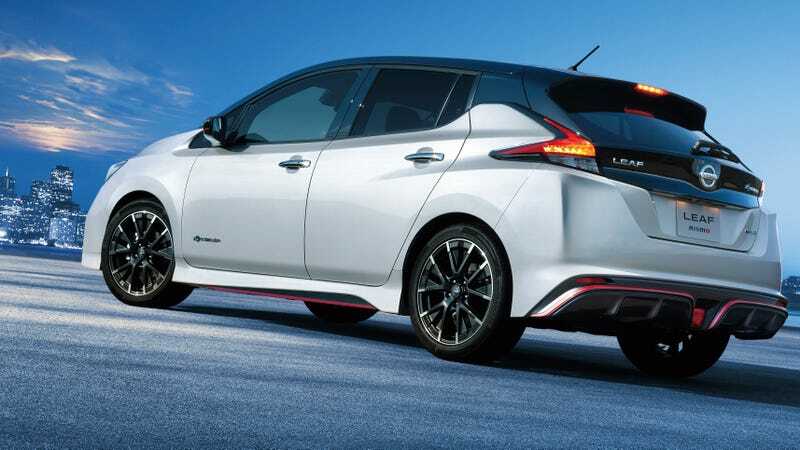 No word from Nissan on as to if or when we’ll the Leaf Nismo stateside.